Rwandan mandazi are little African donuts that are truly addicting. 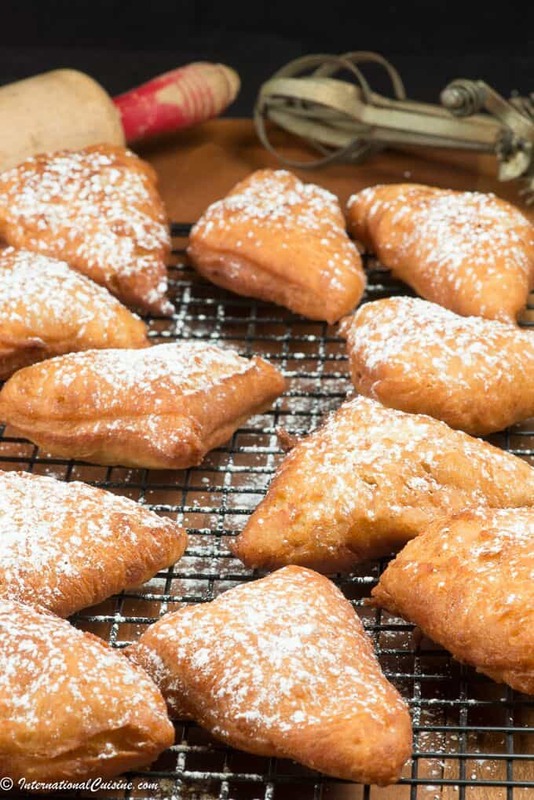 Basically fried dough, one of my favorite things. These are typically made with less sugar than American style donuts, but they a have subtle flavor of coconut, cardamom and cinnamon. You will love these, and they go perfectly with Rwandan coffee or tea. These Rwandan mandazi are crispy on the outside and soft and chewy on the inside. They are often made in the shape of a triangle but can also be made round as well. These are best made in a deep fryer and this one by Hamilton is the one I use and love. These little African donuts are not unique to Rwanda, they are somewhat famous all throughout Africa. They also go by other names like Dabo or Dahir. They are believed to have originated in the African Great Lakes region. You will however find them all over Rwanda. A lovely treat any time of the day, even for breakfast. 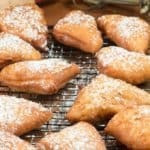 I coated mine with a little shake of confectioners sugar, you could use a combination of cinnamon and sugar as well. Fair warning you can’t just eat one, they are so yummy! Did you know that Rwanda has the largest percentage of women in government than any other country in the world? If you would like to learn more about this amazing little country be sure to check out “Our Journey to Rwanda” plus get more authentic Rwandan recipes you are sure to love. Please note that this page may contain affiliate links in which I will earn a small commission however, it will in no way affect the price you pay. I thank you for your support! Rwandan mandazi are little African donuts that are crispy on the outside and soft and chewy on the inside. Serve with some Rwandan coffee or tea for a real treat! In a small bowl mix the yeast and warm water and stir. Let sit for 5 minutes until yeast dissolves. In a large mixing bowl, add flour, salt, cardamom, and cinnamon and mix. Add vegetable oil, egg, coconut milk, sugar and yeast mixture. Place the dough in an oiled bowl and cover with a towel or plastic wrap. Let it rest for about an hour until the dough rises a little. Heat oil in a deep fryer to 350 degrees or use a deep frying pan or wok. Cut the dough into about 6 pieces to make it easier to roll and cut. Roll each piece so that the dough is about 1/2 inch in thickness. Cut into triangles and place in hot oil. Fry on both sides until golden. Place donuts on paper towels to drain any excess oil. Sprinkle with confectioners sugar and enjoy.